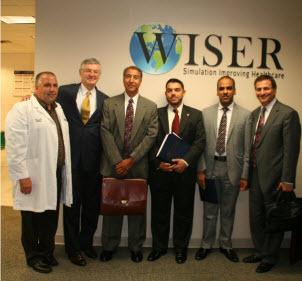 WISER was pleased to host a team of delegates from the embassy of Libya. Dr. Esam Omeish, Dr. Mahmoud Omar and Mr. Walid Al-Soor had the opportunity to learn from Tom Dongilli (WISER Director of Operations) about WISER and how the center plays a key role in patient safety at UPMC and the University of Pittsburgh. Following a brief presentation the delegation was led on an informative tour of center.